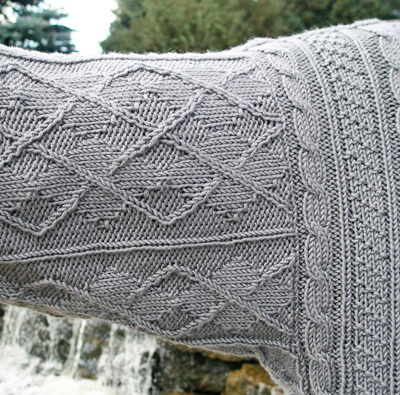 When I first learned about fishermen's ganseys, I was blown away. I was charmed by the look, the endless possibilities for variation, the seamlessness, the construction, and the mathematical precision required to put it all together. I wanted to one day design one of my own. 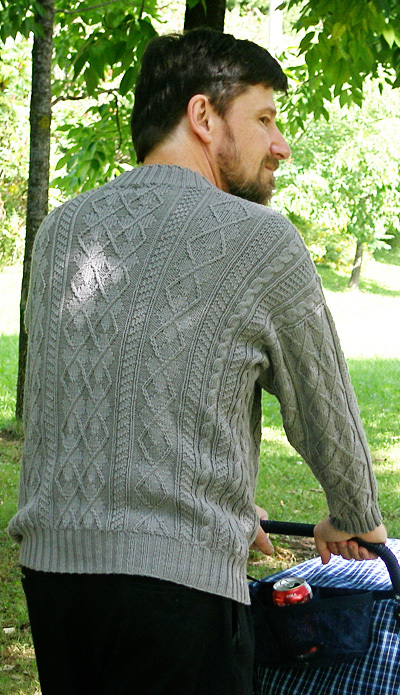 Flash forward some years, and I was looking for a design idea for a man's sweater. 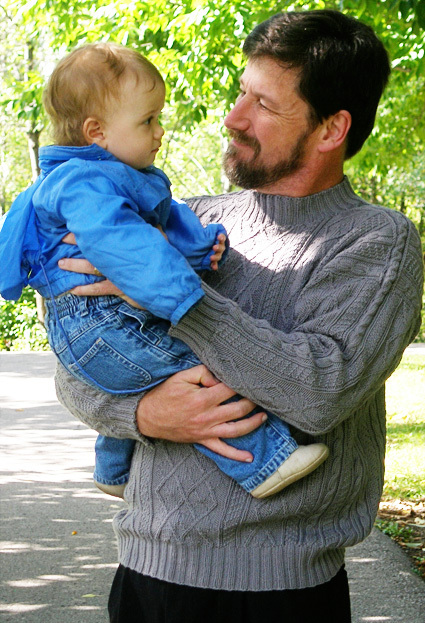 Compared to the number of women's, baby's and children's knitting patterns available, there's not a heck of a lot out there for men, and I was hoping, in some small way, to fix that. Since ganseys look so good on men (well, at least I think so), and since I wanted to design one, it seemed the perfect choice. But what would be the dominant motif? I was looking for something interesting, but also handsome and typically masculine. Argyle fits all those criteria very well, so I adapted it to texture instead of color, and I really liked the result. So did all the men I showed it to! 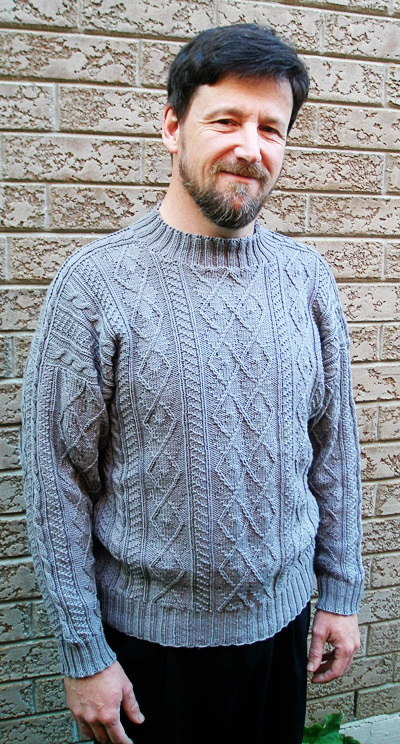 Here, then, is a sweater that is intricate enough to keep a knitter interested; requires skills basic enough that it's not beyond an enthusiastic beginner; and is "manly" enough that even guys with conservative tastes will want to wear it. And all with no seaming! 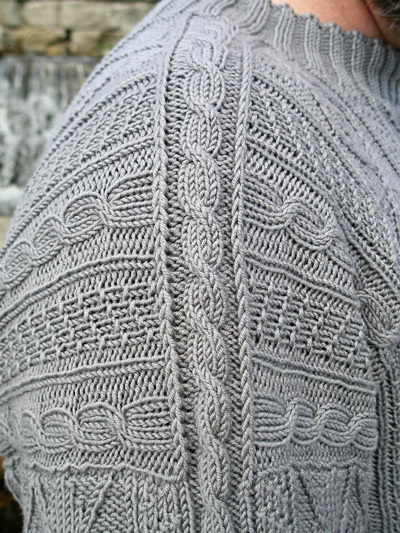 Whenever a bind-off is called for, it is recommended that you use a stretchy one. 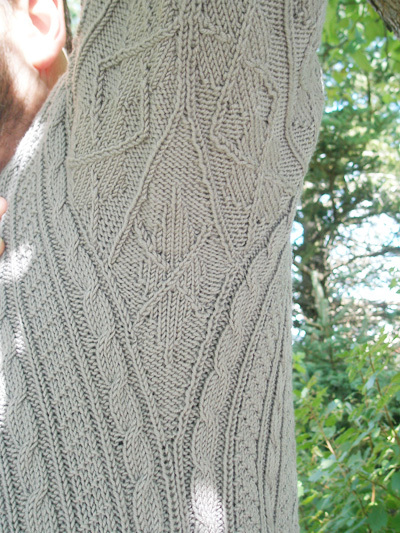 The recommended bind-off is Jeny's surprisingly stretchy bind off. Purl into fbf: Purl into front, back, and front of same st. 2 sts inc'd. M1PR: Make 1 st by purling into the st which is below the next st on the left needle (use the right needle to pick up the loop and place it on the left needle). 1 st inc'd. M1PL: Make 1 st by purling into the st which is two rows below the first st on the right needle (use the left needle to pick up the loop). 1 st inc'd. 1/1 RPC: Sl1 to cn and hold in back, k1; p1 from cn. 1/1 LPC: Sl 1 to cn and hold in front, p1; k1 from cn. 1/1 RC: Sl 1 to cn and hold in back, k1; k1 from cn. 1/1 LC: Sl 1 to cn and hold in front, k1; k1 from cn. C4B: Sl 2 to cn and hold in back, k2; k2 from cn. C4F: Sl 2 to cn and hold in front, k2; k2 from cn. With smaller circular needle, CO 224[248, 256, 276, 312] sts using the long-tail cast-on. Join to work in the rnd, being careful not to twist sts. Pm for beg of rnd. Work k2, p2 rib until work measures 2.5[2.75, 2.75, 3, 3] inches from cast on, inc 40[44, 48, 52, 56] sts evenly across last rnd. 264[292, 304, 328, 368] sts. Place new marker after 132[146, 152, 164, 184] sts to mark half-way point of round. Switch to larger circular needle. Patt rnd 1: *K1, work Rnd 1 of Chart D, k1, work Rnd 1 of Chart A, work Rnd 1 of Chart B, work Rnd 1 of Chart D, work Rnd 1 of Chart C, work Rnd 1 of Chart F, work Rnd 1 of Chart B, work Rnd 1 of Chart E, work Rnd 1 of Chart C, work Rnd 1 of Chart A, k1, work Rnd 1 of Chart E, k1, p1; rep from * once more. Patt rnd 2: *K1, work Chart D, k1, work Chart A, work Chart B, work Chart D, work Chart C, work Chart F, work Chart B, work Chart E, work Chart C, work Chart A, k1, work Chart E, k1, p1; rep from * once more. Patt rnd 1: *K1, work Rnd 1 of Chart D, work Rnd 1 of Chart B, work Rnd 1 of Chart D, work Rnd 1 of Chart C, work Rnd 1 of Chart A, work Rnd 1 of Chart B, work Rnd 1 of Chart F, work Rnd 1 of Chart C, work Rnd 1 of Chart A, work Rnd 1 of Chart B, work Rnd 1 of Chart E, work Rnd 1 of Chart C, work Rnd 1 of Chart E, k1, p1; rep from * once more. Patt rnd 2: *K1, work Chart D, work Chart B, work Chart D, work Chart C, work Chart A, work Chart B, work Chart F, work Chart C, work Chart A, work Chart B, work Chart E, work Chart C, work Chart E, k1, p1; rep from * once more. Patt rnd 1: *Work Rnd 1 of Chart B, work Rnd 1 of Chart D, k1, work Rnd 1 of Chart A, work Rnd 1 of Chart B, work Rnd 1 of Chart D, work Rnd 1 of Chart C, work Rnd 1 of Chart A, k1, work Rnd 1 of Chart A, work Rnd 1 of Chart B, work Rnd 1 of Chart E, work Rnd 1 of Chart C, work Rnd 1 of Chart A, k1, work Rnd 1 of Chart E, work Rnd 1 of Chart C, p1; rep from * once more. Patt rnd 2: *Work Chart B, work Chart D, k1, work Chart A, work Chart B, work Chart D, work Chart C, work Chart A, k1, work Chart A, work Chart B, work Chart E, work Chart C, work Chart A, k1, work Chart E, work Chart C, p1; rep from * once more. Patt rnd 1: *Work Rnd 1 of Chart B, work Rnd 1 of Chart D, work Rnd 1 of Chart C, work Rnd 1 of Chart A, k1, work Rnd 1 of Chart A, work Rnd 1 of Chart B, work Rnd 1 of Chart F, work Rnd 1 of Chart C, work Rnd 1 of Chart A, k1, work Rnd 1 of Chart A, work Rnd 1 of Chart B, work Rnd 1 of Chart E, work Rnd 1 of Chart C, p1; rep from * once more. Patt rnd 2: *Work Chart B, work Chart D, work Chart C, work Chart A, k1, work Chart A, work Chart B, work Chart F, work Chart C, work Chart A, k1, work Chart A, work Chart B, work Chart E, work Chart C, p1; rep from * once more. Patt rnd 1: *Work Rnd 1 of Chart B, work Rnd 1 of Chart D, work Rnd 1 of Chart C, work Rnd 1 of Chart F, work Rnd 1 of Chart B, work Rnd 1 of Chart D, work Rnd 1 of Chart C, work Rnd 1 of Chart F, work Rnd 1 of Chart B, work Rnd 1 of Chart E, work Rnd 1 of Chart C, work Rnd 1 of Chart F, work Rnd 1 of Chart B, work Rnd 1 of Chart E, work Rnd 1 of Chart C, p1; rep from * once more. Patt rnd 2: *Work Chart B, work Chart D, work Chart C, work Chart F, work Chart B, work Chart D, work Chart C, work Chart F, work Chart B, work Chart E, work Chart C, work Chart F, work Chart B, work Chart E, work Chart C, p1; rep from * once more. Cont patt as set in Patt rnd 2, repeating charts as needed, until work measures 13.25[13.5, 13, 13, 12.75] inches from cast on edge (approx. 86[86, 82, 80, 78] rnds in cable patt, not including ribbing), ending after an even rnd of charts. Round 1: *Work in chart patts as est to 1 st before m, work Rnd 1 of Chart G[H, I, I, J]; rep from * once more. 268[296, 308, 332, 372] sts. 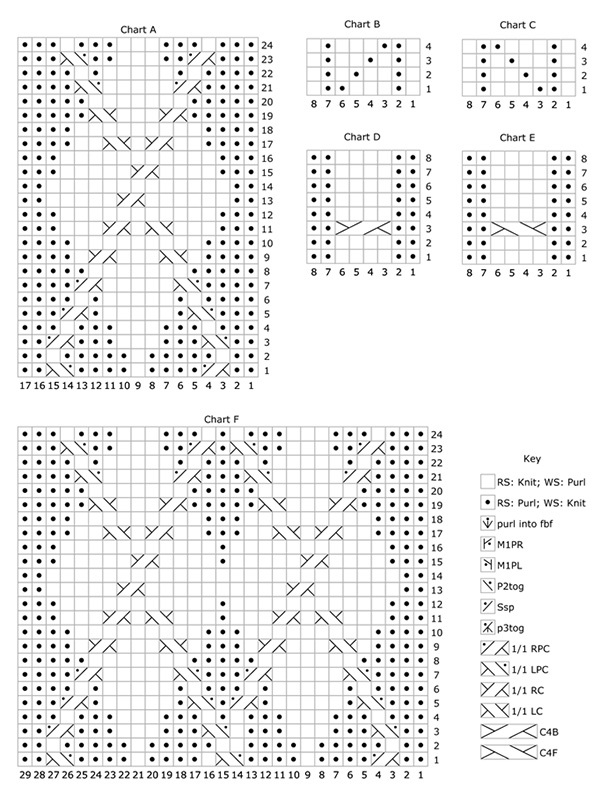 Cont chart patts as set, repeating charts as needed, until you have completed Rnd 26[30, 34, 34, 38] of Chart G[H, I, I, J]. 292[324, 340, 364, 408] sts. Work measures approx. 16.5[17.25, 17.25, 17.25, 17.5] inches from cast on edge. Next row [RS]: Patt to 15[17, 19, 19, 21] sts before m, place rem 161[179, 189, 201, 225] sts on holder and turn work. Cont working back and forth in patt on these 131[145, 151, 163, 183] sts until work from cast on edge measures 23[24, 24.5, 24.5, 25] inches, ending with RS facing for next row. You will have completed approximately 52[54, 58, 58, 60] rows worked flat by this point. Next row [RS]: Cont patt as set across the first 51[56, 58, 63, 70] sts and place these sts on holder for Left Front Yoke, patt across next 29[33, 35, 37, 43] sts and place these sts on holder for Front Neck, then patt across last 51[56, 58, 63, 70] sts (Right Front Yoke). You will now be working the Right Front Yoke on these last 51[56, 58, 63, 70] sts only. [WS]: Patt to last 2 sts, ssp. [RS]: Ssk, patt to end. 44[48, 50, 54, 60] sts rem. Break yarn and place these sts on holder. [WS]: P2tog, patt to end. [RS]: Patt to last 2 sts, k2tog. With RS facing, place first and last sets of 15[17, 19, 19, 21] sts from the 161[179, 189, 201, 225] held Back sts and place them on separate holders for the Armhole Gussets. 131[145, 151, 163, 183] sts rem on holder for Back. With RS facing and with large circular needle, rejoin yarn to Back Yoke sts and cont patt as set, repeating charts as needed, until Back Yoke measures same as Front Yoke to held shoulder sts, ending on same row of charts. Break yarn. With RS facing, place the first 44[48, 50, 54, 60] sts (Right Back Yoke) on one holder, the middle 43[49, 51, 55, 63] sts (Back Neck) on another holder, and the last 44[48, 50, 54, 60] sts (Left Back Yoke) on the third stitch holder. Place Left Back Yoke sts and Left Front Yoke sts on US #2.5/3mm straight needles with point of needles pointing toward neck. With RS facing and scrap yarn in a contrasting color, provisionally cast on 10 sts onto the needle holding the Left Back Yoke sts. Still using scrap yarn, with RS facing, knit these 10 saddle sts onto the needle holding the Left Front Yoke sts. Break scrap yarn. Join main yarn and, with WS facing, purl the 10 saddle sts onto the needle holding the Left Back Yoke sts. Turn work so RS of Left Front Yoke and Left Back Yoke pieces are facing. You now have 54[58, 60, 64, 70] sts on the left needle and 44[48, 50, 54, 60] sts on the right needle. Row 1 [RS]: Sl1 knitwise, work Row 1 of Chart D, ssk, turn. Row 2 [WS]: Sl1 purlwise, work Row 2 of Chart D, p2tog, turn. Cont patt as set until all 44[48, 50, 54, 60] Left Back Yoke sts and all 44[48, 50, 54, 60] Left Front Yoke sts have been incorporated into the saddles and 10 sts rem. Break yarn and place these 10 sts on a holder. Place Right Back Yoke sts and Right Front Yoke sts on US #2.5/3mm straight needles with point of needles pointing toward neck. With RS facing and scrap yarn in a contrasting color, provisionally cast on 10 sts onto the needle holding the Right Front Yoke sts. Still using scrap yarn, with RS facing, knit these 10 saddle sts onto the needle holding the Right Back Yoke sts. Break scrap yarn. Join main yarn and, with WS facing, purl the 10 saddle sts onto the needle holding the Right Front Yoke sts. Turn work so RS of Right Front Yoke and Right Back Yoke pieces are facing. You now have 54[58, 60, 64, 70] sts on the left needle and 44[48, 50, 54, 60] sts on the right needle. 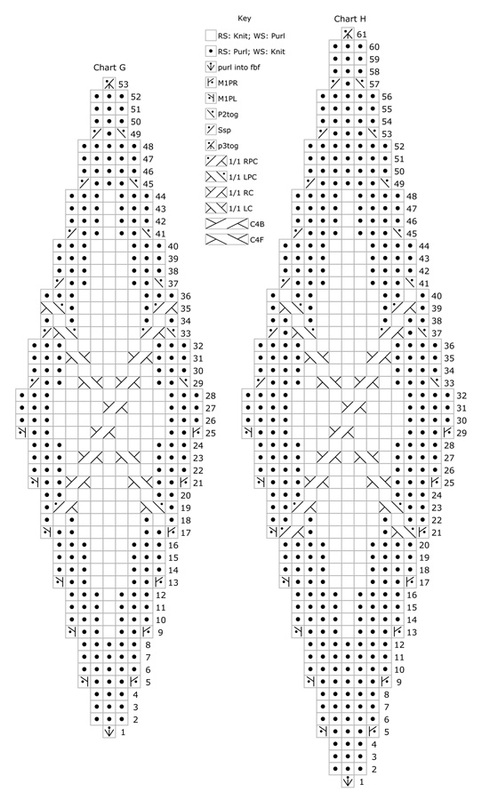 Row 1 [RS]: Sl1 knitwise, work Row 1 of Chart E, ssk, turn. Row 2 [WS]: Sl1 purlwise, work Row 2 of Chart E, p2tog, turn. Cont patt as set until all 44[48, 50, 54, 60] Right Front Yoke sts and all 44[48, 50, 54, 60] Right Back Yoke sts have been incorporated into the saddles and 10 sts rem. With larger dpns, join yarn to 15[17, 19, 19, 21] held left gusset sts and work Rnd 27[31, 35, 35, 39] of Chart G[H, I, I, J] across these sts, pick up and knit 50[55, 59, 64, 67] sts up to held saddle sts, k1 from holder, work Rnd 1[1, 5, 5, 1] of Chart D across next 8 sts from holder, k1 from holder, then pick up and knit 50[55, 59, 64, 67] sts down to beg of gusset. 125[137, 147, 157, 165] sts. Rnd 2: Work Rnd 28 of Chart G, work Rnd 2 of Chart C, work Rnd 2 of Chart A, work Rnd 2 of Chart B, work Rnd 2 of Chart A, k1, work Rnd 2 of Chart D, k1, work Rnd 2 of Chart A, work Rnd 2 of Chart C, work Rnd 2 of Chart A, work Rnd 2 of Chart B.
Rnd 2: Work Rnd 32 of Chart H, k1, work Rnd 2 of Chart A, k1, work Rnd 2 of Chart F, work Rnd 2 of Chart B, work Rnd 2 of Chart D, work Rnd 2 of Chart C, work Rnd 2 of Chart F, k1, work Rnd 2 of Chart A, k1. Rnd 2: Work Rnd 36 of Chart I, k1, work Rnd 6 of Chart A, work Rnd 2 of Chart C, work Rnd 6 of Chart D, work Rnd 2 of Chart B, work Rnd 6 of Chart A, k1, work Rnd 6 of Chart D, k1, work Rnd 6 of Chart A, work Rnd 2 of Chart C, work Rnd 6 of Chart E, work Rnd 2 of Chart B, work Rnd 6 of Chart A, k1. Rnd 2: Work Rnd 36 of Chart I, k1, work Rnd 6 of Chart D, k1, work Rnd 6 of Chart A, k1, work Rnd 6 of Chart F, work Rnd 2 of Chart B, work Rnd 6 of Chart D, work Rnd 2 of Chart C, work Rnd 6 of Chart F, k1, work Rnd 6 of Chart A, k1, work Rnd 6 of Chart D, k1. Rnd 2: Work Rnd 40 of Chart J, work Rnd 2 of Chart C, work Rnd 2 of Chart D, work Rnd 2 of Chart B, work Rnd 2 of Chart F, work Rnd 2 of Chart C, work sts 2-8 of Rnd 2 of Chart B, work Rnd 2 of Chart D, work sts 1-7 of Rnd 2 of Chart C, work Rnd 2 of Chart B, work Rnd 2 of Chart F, work Rnd 2 of Chart C, work Rnd 2 of Chart E, work Rnd 2 of Chart B. **Cont patt as set until you have completed all 53[61, 69, 69, 77] rows of Chart G[H, I, I, J]. 111[121, 129, 139, 145] sts. Next rnd: P1, patt to end of rnd. Dec rnd: P1, skp, patt to last 2 sts, k2tog. Work-even rnd: P1, k1, patt as est to last st, k1. 63[69, 73, 79, 83] sts rem. Next rnd: P1, k1, patt to last st, k1. Cont patt as set in last rnd until sleeve measures 16[16.5, 17.25, 17.75, 18] inches from pick up edge, or 2[2, 2.25, 2.25, 2.5] inches shorter than desired total length. Next rnd: Knit, decreasing 3[5, 9, 11, 11] sts evenly across rnd. 60[64, 64, 68, 72] sts. Switch to smaller dpns and work in K2, p2 rib for 2[2, 2.25, 2.25, 2.5] inches. With larger dpns, join yarn to 15[17, 19, 19, 21] held right gusset sts and work Rnd 27[31, 35, 35, 39] of Chart G[H, I, I, J] across these sts, pick up and knit 50[55, 59, 64, 67] sts up to held saddle sts, k1 from holder, work Rnd 1[1, 5, 5, 1] of Chart E across next 8 sts from holder, k1 from holder, then pick up and knit 50[55, 59, 64, 67] sts down to beg of gusset. 125[137, 147, 157, 165] sts. Rnd 2: Work Rnd 28 of Chart G, work Rnd 2 of Chart C, work Rnd 2 of Chart A, work Rnd 2 of Chart B, work Rnd 2 of Chart A, k1, work Rnd 2 of Chart E, k1, work Rnd 2 of Chart A, work Rnd 2 of Chart C, work Rnd 2 of Chart A, work Rnd 2 of Chart B.
Rnd 2: Work Rnd 32 of Chart H, k1, work Rnd 2 of Chart A, k1, work Rnd 2 of Chart F, work Rnd 2 of Chart B, work Rnd 2 of Chart E, work Rnd 2 of Chart C, work Rnd 2 of Chart F, k1, work Rnd 2 of Chart A, k1. Rnd 2: Work Rnd 36 of Chart I, k1, work Rnd 6 of Chart A, work Rnd 2 of Chart C, work Rnd 6 of Chart D, work Rnd 2 of Chart B, work Rnd 6 of Chart A, k1, work Rnd 6 of Chart E, k1, work Rnd 6 of Chart A, work Rnd 2 of Chart C, work Rnd 6 of Chart E, work Rnd 2 of Chart B, work Rnd 6 of Chart A, k1. Rnd 2: Work Rnd 36 of Chart I, k1, work Rnd 6 of Chart D, k1, work Rnd 6 of Chart A, k1, work Rnd 6 of Chart F, work Rnd 2 of Chart B, work Rnd 6 of Chart E, work Rnd 2 of Chart C, work Rnd 6 of Chart F, k1, work Rnd 6 of Chart A, k1, work Rnd 6 of Chart D, k1. Rnd 2: Work Rnd 40 of Chart J, work Rnd 2 of Chart C, work Rnd 2 of Chart D, work Rnd 2 of Chart B, work Rnd 2 of Chart F, work Rnd 2 of Chart C, work sts 2-8 of Rnd 2 of Chart B, work Rnd 2 of Chart E, work sts 1-7 of Rnd 2 of Chart C, work Rnd 2 of Chart B, work Rnd 2 of Chart F, work Rnd 2 of Chart C, work Rnd 2 of Chart E, work Rnd 2 of Chart B.
Rep from ** to *** as for Left Sleeve. Remove provisional yarn from the Left Saddle and place the 10 resulting live sts on a stitch holder. Repeat for the Right Saddle. With RS facing and smaller dpns, knit across 43[49, 51, 55, 63] sts held Back Neck sts, knit across 10 sts from holder for Left Saddle, pick up and knit 10[11, 13, 14, 15] sts down the Left Front neck edge; knit across 29[33, 35, 37, 43] held sts from Front Neck, pick up and knit 10[11, 13, 14, 15] sts from Right Front neck edge, finally knit across 10 sts from holder for Right Saddle. 112[124, 132, 140, 156] sts. Join to work in the round and pm for beg of rnd. Work in K2, p2 ribbing for 1.5[1.75, 1.75, 2, 2] inches. 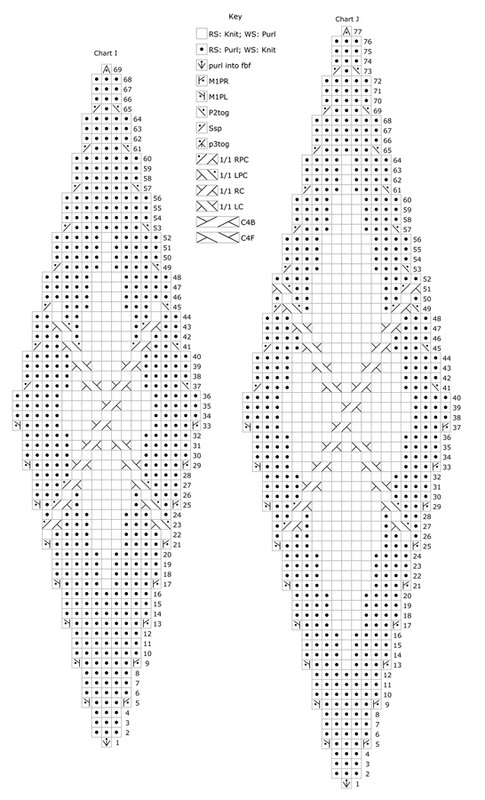 Block to given finished measurements (see schematic below). Kathleen learned to knit when she was about seven, but became utterly obsessed with it in adulthood, trying out any technique that struck her fancy, no matter how simple or complex. Now she often thinks up her own patterns, usually inspired by her three fabulous daughters, but occasionally by her incredible (knitter) husband. She has an extremely large number of works-in-progress, which are chronicled on her blog.